The fourth missile warning satellite that Lockheed Martin built for the U.S. Air Force sent its initial images back to Earth as part of the “first light” milestone. 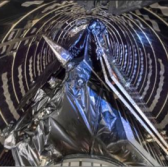 Lockheed said Wednesday the Space Based Infrared System Geosynchronous Earth Orbit Flight-4 satellite switched on its sensors in February during the vehicle checkout phase as part of the milestone. “With the launch of this satellite, SBIRS can now provide global coverage, with better-than-specified sensor pointing accuracy and the ability to detect even more targets than anticipated,” said Tom McCormick, vice president of Lockheed’s overhead persistent infrared systems mission area. SBIRS GEO Flight-4 is the newest satellite of the service branch’s SBIRS constellation that works to detect missile launches, build up situational awareness, broaden technical intelligence collection and support ballistic missile defense efforts. The satellite responded to initial commands minutes after it took off on Jan. 19 aboard a United Launch Alliance-made Atlas V rocket from Cape Canaveral Air Force Station in Florida. Lockheed received a potential $1.86 billion contract in 2014 to complete development work on the fifth and sixth SBIRS GEO satellites.